Look for the DID you want to use for the trunk and note the number, routing, and POP. 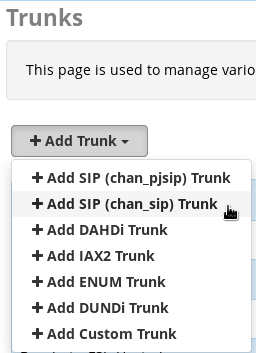 Click +Add Trunk -> +Add SIP (chan_pjsip) Trunk. 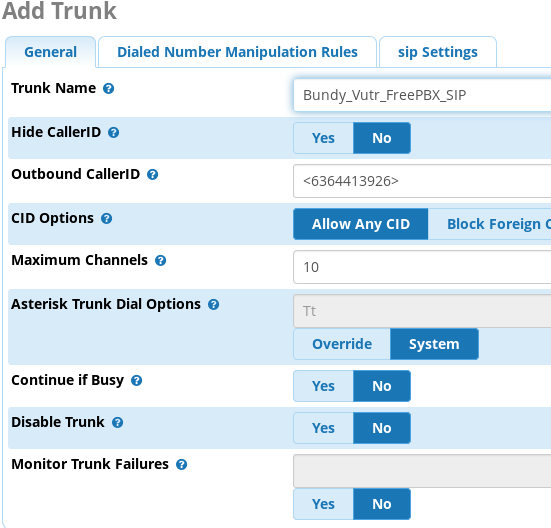 PJSIP simplifies the setup from the PBX side and is the new default for Asterisk. You can read all about it straight from Digium if you want. Fill out the General tab as desired. 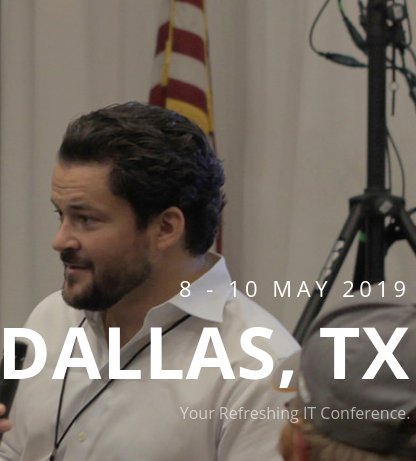 Note the outbound Caller ID format and also set a reasonable maximum channels value to protect against extreme charges if a SIP user's credentials are ever compromised. 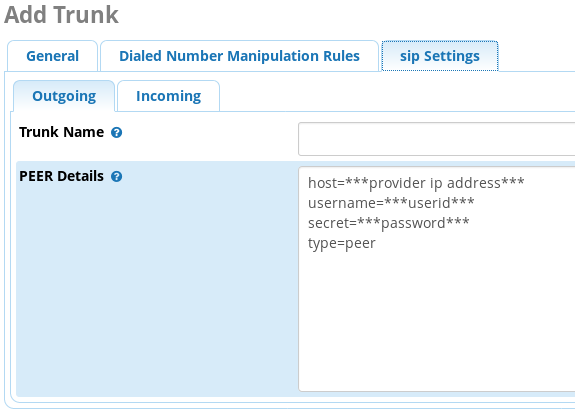 I generally leave the Caller ID blank and set it on the outbound routes, but it is easy to miss there. Leave the Dialed Number Manipulation Rules empty. I always recommend handling that on the outbound route(s). 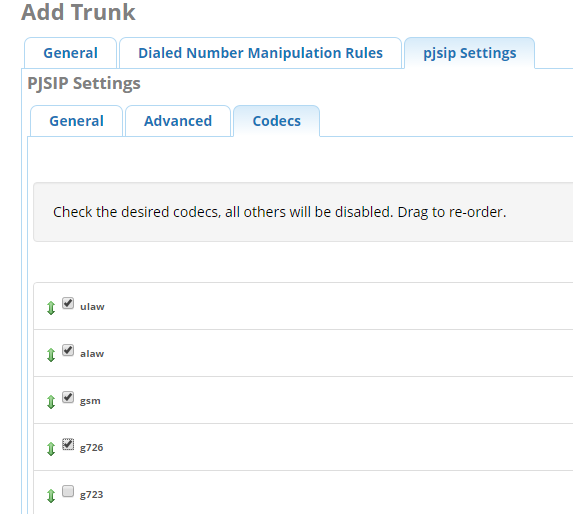 Fill out the General tab on PJSIP Settings with your voip.ms information noted from above. The username is the account number, or if you use a sub account it is the account number _subaccountname. The secret is the password for the account on VoIP.ms. 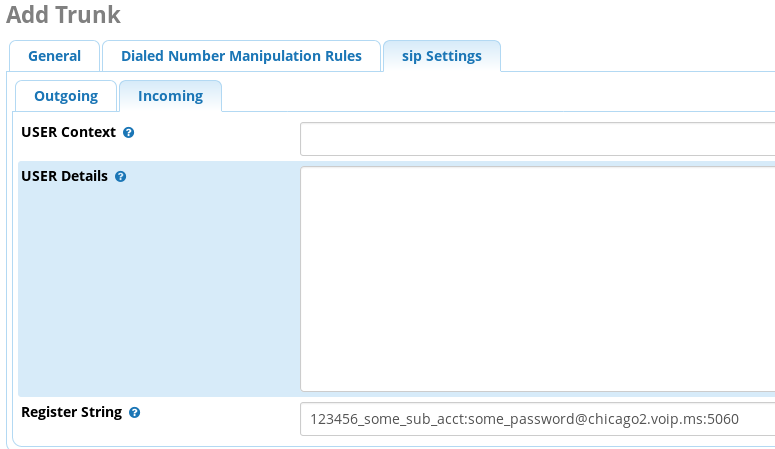 The SIP server is the pop name with the dash removed and .voip.ms appended. Scroll to the bottom and change detect fax to enabled if you want to enable inbound faxing on this trunk. 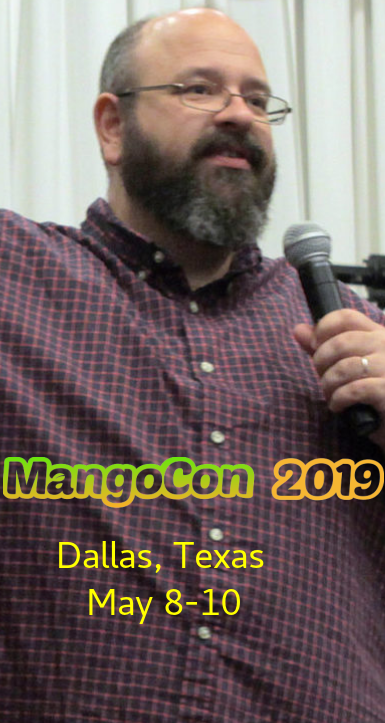 VoIP.ms does not support T.38 FoIP but faxing over SIP works for most simple needs. You can leave the codecs tab alone unless you have changed default codecs on VoIP.ms side. Click submit at the bottom of the screen, and then after it finishes, click the red Apply Config button. 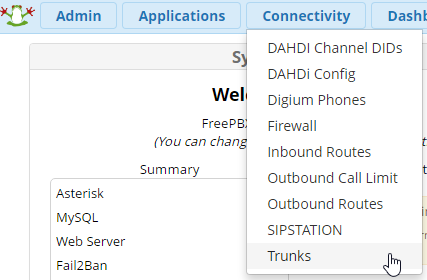 Go back to the FreePBX dashboard and you should see the trunk online after you click the little circle arrows to refresh. 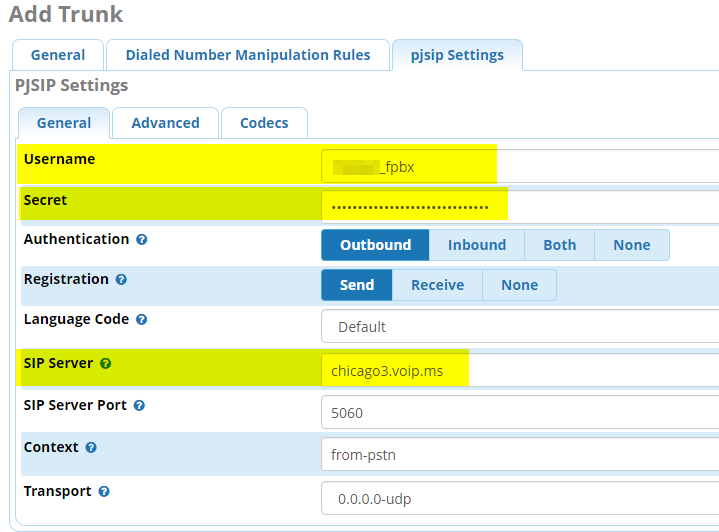 Some people have reported issues using the PJSIP settings with VoIP.ms. 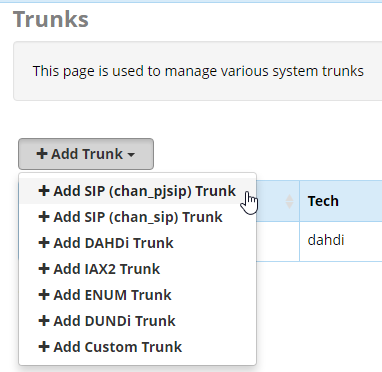 I have been using it for months with no problems, but if you are having problems, then you can create a CHAN_SIP based trunk with no problems. 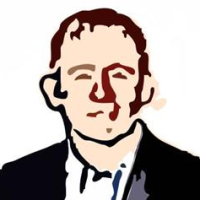 If you have problems with PJSIP, or jsut need to confirmed support of CHAN_SIP from your provider, setting up a CHAN_SIP trunk is not much more difficult. The General tab gets filled out the same as with PJSIP. And populate it with your information. No spaces or characters in the trunk name as that gets used as the Asterisk context. Here are the settings, you should only need to edit the first 4 lines appropriately. On the Incoming tab , again delete the default data. This time leave the USER Context and USER Details blank and only populate the registration string. 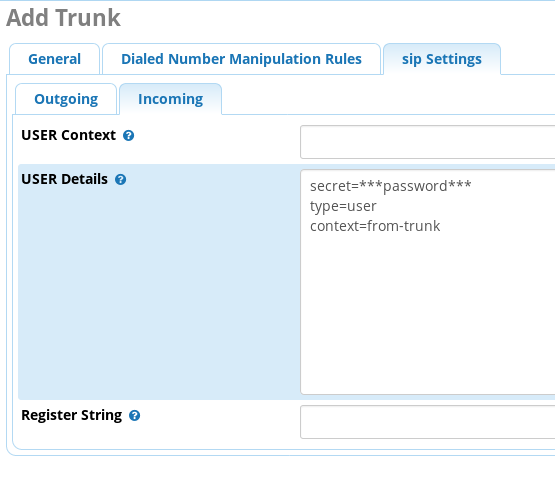 This is why you want to avoid @ or : in your SIP trunk password. Just followed this, worked great. 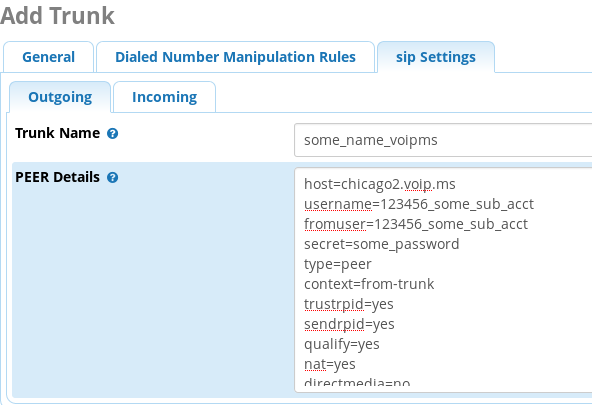 With VoIP.ms and PJSIP, you also need to go to the advanced tab and change the default expiration time from 3600 to 120. 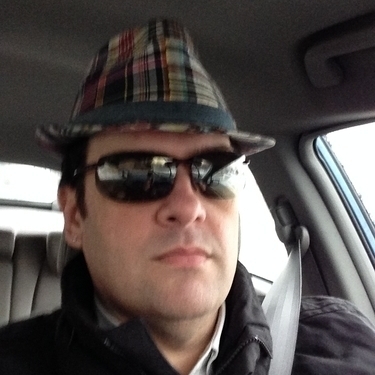 I have not tested this with other providers yet as it would be disruptive to a client. When I have time I will setup a backup provider and change my extension to use that normally and see how things go. The problem is that with a not very used system, it will still reregister every hour, so to catch it, I have to make a call between the fial time and the reregister time. Post 2 updated with the CHAN_SIP instructions.. sorry to be so bad about this. If you find yourself still trying to get incoming calls working after several hours (like me), be advised that the default DID settings on voip.ms will not work. You merely have to set up a sub-account and make sure to set the authentication type as user/password authentication. Add your DID's to the sub-account and authenticate with the accountnumber_subaccount convention and use the password you created when setting up the sub-account. 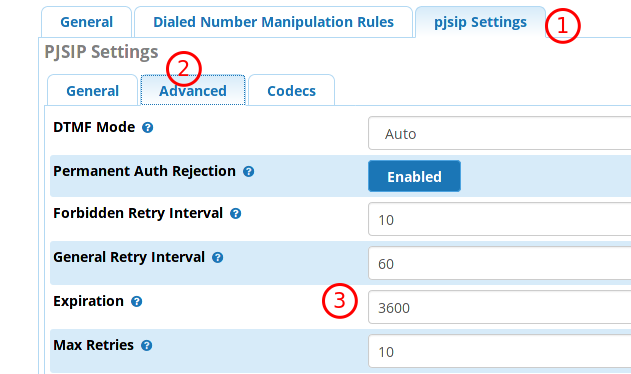 Follow up, You also need to set max retries to 0 or the PJSIP trunk can potentially go offline and stop trying. 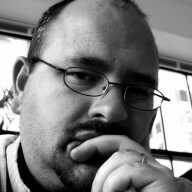 I have never experienced an issue using the primary account on VoIP.ms. I highly recommend against it, always. But, I have never had a problem using it.